Greetings, harvest 2017 has arrived! The goal of this newsletter is to provide clients and wine industry decision makers with timely, valuable winery & vineyard real estate information. I am a licensed California Real Estate Broker specializing in wineries & vineyards since 2004. Originally I was based in the Napa Valley, and I am now based in Paso Robles with a focus on Monterey, San Luis Obispo & Santa Barbara Counties. The 320 acre property (below) is a new exclusive listing. This property has a lot to offer for the price, including a large vineyard, four additional vacant parcels, beautiful home, and a boutique winery. Activity on Kenneth Volk Vineyards has been steady with over 50 registered buyers and several serious parties, plus an LOI. At the moment, the winery is available and the real estate/equipment is being offered as a stand-alone offering. Another exclusive listing, El Pomar Gap Vineyard is a viable vineyard on a great site with a hobby winemaking setup at an entry-level price. I also have a confidential pocket listing, wine brand/business. If you reply to this newsletter, I will send you the teaser information. Currently, there are approximately 34 active winery and vineyard listings on the Central Coast with 1.5 selling per month. This "absorption rate" of 23 months suggests it will take less than two years to sell the current listing inventory. In the Insider Tips section, I have highlighted eight opportunities that deserve attention. Please get in touch for details on these or for a list that fits your criteria. Comparable sales are expanding on the Winery/Vineyard "Comps" list. The most recent transactions are at the top of the list. Through appraisers and tax records, I was able to track down several of the sales prices on a few of the larger transactions. Opportunities and comps run the gamut from $1M-$54M. Take a break and enjoy. This 320+/- acre legacy-vineyard property has historical significance and is located in the Paso Robles AVA, Estrella District. The 74 acres of premium red varieties is primarily Cabernet Sauvignon, Cabernet Franc, Petit Verdot, Malbec, Petite Sirah, Zinfandel and Sangiovese. The large property also includes a main home, a boutique winery with an inviting tasting room and 5,000 case permit, two well-maintained mobile homes, 155+ producing olive trees, cattle land, and vacant land to the north with four developable parcels. The main home is a beautiful 5,000+sf quality custom home perched on a hill with gorgeous views, a 2bed/2bath Casita and a large subterranean wine cellar. The main house offers a brilliant full or part-time residence or an ideal vacation rental. The successful wine brand, associated inventory, and equipment are included in the package offering. This landmark winery & tasting room is being sold turn-key with equipment to produce 25,000 cases annually. Nestled in Santa Barbara's scenic Santa Maria Valley on the Foxen Canyon Wine Trail is the original Byron Winery. Industry legend Kenneth Volk has extensively upgraded and equipped the facility for high-end, modern winemaking. The property provides a peaceful setting with native gardens, tranquil creek, event areas, a commercial kitchen and extensive office space. The 4+ acres of fallow vineyard land is ideally suited for Chardonnay and Pinot Noir. Detailed Offering Memorandum, virtual tour and 3D interactive floor plan available. 23+ acre property located in the El Pomar AVA of Paso Robles. Hwy 41 E. frontage that includes flat, usable land. 16+ acre vineyard comprised of Zinfandel, Grenache Blanc and Petite Sirah. The comfortable home features a large open kitchen and a variety of reclaimed materials. ** Winery / Vineyard "Comps"
White Cliff's Ranch sold 1/27/2017, 7377 Adelaida Rd. 11 acres of Syrah, Tannat, Mourvedre, Petit Verdot and Cabernet Sauvignon, 21 acres ripped and ready for planting. Adjacent to Adelaida Winery. Sold for $2,150,000. Disclaimer: These Central Coast winery & vineyard transactions represent recent sales. Every effort is made to provide accurate information on these sold transactions. Jenny Heinzen Real Estate does not warrant the information. The purpose of this list is to provide buyers and sellers with a big picture understanding of the Central Coast winery & vineyard real estate market. Buyers/sellers should not rely on these figures for due diligence or property valuation. 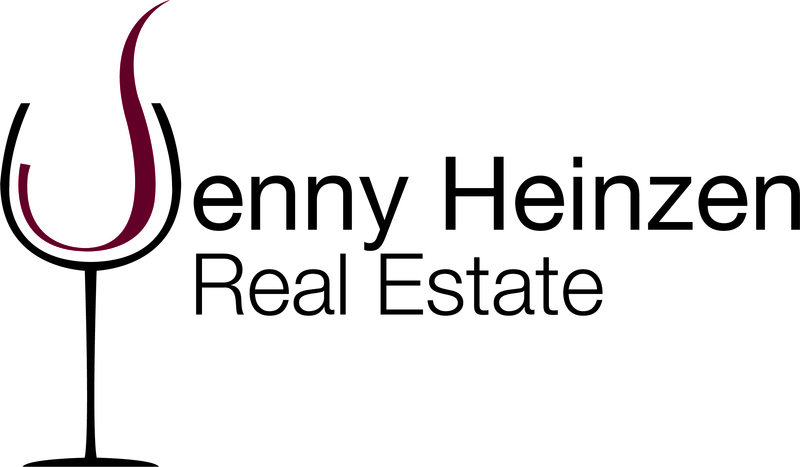 Please get in touch with Jenny Heinzen to receive an opinion of value and comparative market analysis (CMA) on a specific property. Jenny Heinzen has been a California Real Estate Broker BRE#01436553 since 2004 and member of the National Association of Realtors. If your property is currently listed with a Broker, it is not my intention to solicit the offerings of other Brokers. If you choose to unsubscribe, you’ll stop receiving these newsletters. Jenny Heinzen reserves all copyrights on text or images in this newsletter. The text or images in the newsletter may not be copied or distributed without prior written permission of Jenny Heinzen Real Estate. If there is an approved use of content, the following conditions should be followed: The source of copied material should be mentioned as Jenny Heinzen Real Estate and this statement should appear on all forms of distribution. The information contained in this newsletter is provided by Jenny Heinzen Real Estate as a service to clients and the wine industry. It does not contain legal or financial advice. Although I try to provide quality information, I do not guarantee results obtained from the use of this information, and without warranty of any kind, express or implied, including, but not limited to warranties of performance for a particular purpose. In no way is Jenny Heinzen Real Estate liable to a reader or any other party for any damages, costs of any character including but not limited to direct or indirect, consequential, incidental or other costs or damages, via the use of the information contained in the newsletters. Copyright © 2017 JENNY HEINZEN REAL ESTATE, All rights reserved.